Stop in today and get an estimate within 15 minutes. The state of Wisconsin only requires one estimate for collision repair. STOP IN AND GET A QUOTE IN 15 MIN! We are one of the leading auto repair shops serving customers in the Lake Country area. All services are performed by highly qualified, certified & experienced auto body technicians. When you get auto body work done at our facility, you can rest assured it’s top quality. We don’t believe in performing rushed repairs to meet a deadline or cutting corners to save money. We have auto body technicians specializing in every aspect of collision repair and car maintenance, including ASE and I-CAR certifications. Our technicians all have a personal reputation for outstanding work. We are a preferred auto body shop for most major insurance companies because we make filing claims as simple as possible, including working directly with providers to accelerate the process. We are much more than a typical auto body shop. We offer a complete range of services including smaller jobs like vehicle buffing, complete paint jobs and painted pinstripes. An accident doesn’t just damage your vehicle, it can turn your life upside down. Let Merton Auto Body, the leading auto body and repair shop in Sussex, restore your vehicle (and your peace of mind). We have the people, tools, and parts to get the job done according to manufacturer standards and yours. Founded in 1946 by John Rellatz, Merton Auto body was once confined in just a small garage in downtown Merton. Around 30 years later, the company was passed on to his son, Ron, where the business was relocated to a bigger building and hired Paul Shiellack and Steve Anderson. The two soon purchased the shop in 1995, and in 2014, Ryan Carriveau took over the operations. 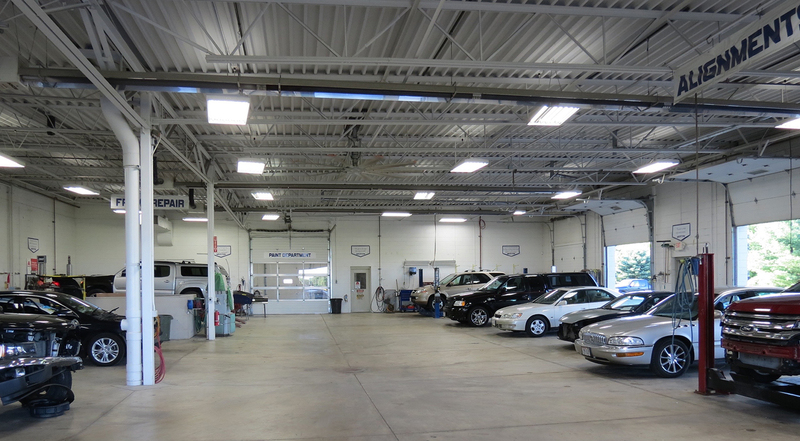 And today, we’re the leading auto body shop in the Waukesha County, with a state-of-the-art facility that meets the demands of customers and their increasingly complex vehicles. We are known for our top-notch professional auto body professionals. From the repair specialists and painters, to the estimators, our people are I-CAR Gold certified technicians, with additional certification from the National Institute for Automotive Service Excellence. We work as a team to accurately assess the damage and do the necessary repairs, so you can get back on the road as soon as possible. Other than collision repair, we also offer a range of other auto body services in Sussex and the surrounding Lake Country area, including hail repair, glass repair and replacement, and paintless dent repairs. We also provide detailing, buffing, painting, rust proofing, and wheel alignments. Merton Auto Body technicians are certified by the National Institute for Automotive Service Excellence. ASE exams are not easy. Only two out of every three test-takers pass on their first attempt. To remain ASE certified professionals, we’re retested every five years to keep up with the ever advancing automotive technology. An estimate at Merton Auto body is free and is ready within 15 minutes of your arrival.